RED DEER - As we begin the 2017-18 season, Hockey Alberta would like to remind all its Members to be vigilant when it comes to the potential for email scams targeting not-for-profit organizations, including minor hockey associations. Hockey Alberta is already aware of at least one scam attempt involving a Local Minor Hockey Association, so we want our Members to ensure you are exercising caution when managing the financial aspects of your organization. Ensure your Board of Directors is up to date on all financial procedures for your organization. TRUST YOUR INSTINCTS. If the request doesn’t seem “right”, check it out before you pay. For any questions, contact Jeremy Haluschak, Manager, Business Operations at the Hockey Alberta office., 403-342-6777. 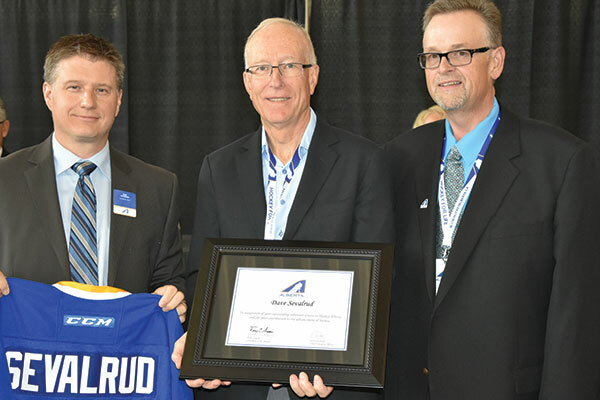 RED DEER – Brock Harrington, of Drumheller, and Allan Mowbray, of Calgary, were elected as new Directors at Large of the Hockey Alberta Board of Directors on Saturday. The election was part of the 110th Annual General Meeting held at Red Deer College. A total of six individuals let their names stand for election. Harrington and Mowbray will join current members Terry Engen (Chair), Fran Zinger (Vice Chair), Rob Virgil (Past Chair), Len Samletzki (Finance Director), and Jerrold Lemko (Director at Large). Fred Horbay and David Sevalrud are the outgoing members of the Board. 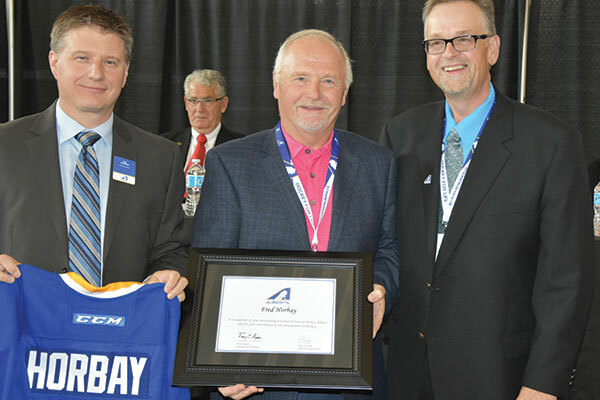 Engen presented each with a farewell gift from Hockey Alberta, and thanked them for their years of service to the organization, and the perspectives and challenging questions that each brought to discussions around the Board table. In other business at the AGM, Notices of Motion were approved to expand the Board of Directors to nine members, and to shift the Finance Director position from an elected position to one that is appointed annually. As a result, the 2018 AGM will have three Directors-at-Large positions up for election. Doug Kinsella was recognized with 2017 Chair of the Board award, presented by Terry Engen. Kinsella led the process that resulted in the creation of CR Knights through the merger of the Calahoo and Riviere Qui Barre minor associations. Kinsella is currently the Past President of the CR Minor Hockey Association. RED DEER - The power of sport was at the forefront as Catriona Le May Doan delivered the keynote address to kick off Hockey Alberta’s 2017 Hockey Conference and Annual General Meeting on Friday night at the Sheraton Hotel. The two-time Olympic gold medalist, and Olympic bronze medalist, shared stories of her journey, and the path that took her to the highest level of success an athlete can achieve. "Those medals represent about two-and-a-half minutes of a 23-year journey. To me, success is about that entire journey," Le May Doan said of her three Olympic medals, which she brought with her to pass around the crowd. "The reason I was successful was because I didn’t burn out mentally. Le May Doan also stressed the importance of being a multi-sport athlete, and focused on several examples of successful multi-sport athletes. "It’s our duty to say, in hockey, and in all sports, ’what else do you do?’" she said. She also told the 150 people in attendance it’s their job to ensure kids don’t get burnt out mentally, and to make sure they’re still having fun. "We’re seeing kids over-scheduled these days, and we’re seeing kids over-stressed," Le May Doan said. "We’re not allowing kids to just play." Le May Doan closed her keynote address by reinforcing her believe of the power of sport, saying "not everyone likes change, but when you put the athletes first, and you embrace sport for life, change is the right thing. Sport has the ability the change lives, and to change lives for good." 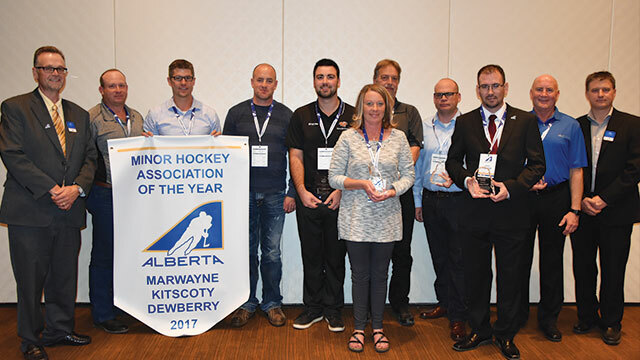 Following the keynote address, seven individuals and four minor hockey associations were recognized for their outstanding contributions to hockey in Alberta, as the 2017 Hockey Alberta Awards, sponsored by BFL Canada, were presented. RED DEER - Registration is now open for 2005-born male athletes, as well as 2003 & 2004-born female athletes to take part in regional selection camps for the 2018 Alberta Winter Games. The Alberta Winter Games run February 16-19, 2018 in Fort McMurray, AB. Not sure of your region? Click here for the Regional Directory, or click here for the Boundary Map. Space at each regional camp is limited, and registration is on a first come, first served basis. The deadline to register for a regional camp is Friday, November 3. Not sure of your region? Click here for the Boundary Map. For more information on the Alberta Winter Games, click here. RED DEER - Peewee coaches across Alberta will once again benefit from the Chevrolet Power of Play Program. Registration is now open to all Peewee teams in Alberta for the 2017-18 season, and a limited number of coach kits are available on a first come, first served basis. Registration is intended to be completed by the team’s coach for Hockey Canada verification purposes. Go to ChevroletHockey.com for more information on the Chevrolet Power of Play program. RED DEER - Two-time Olympic gold-medalist Catriona Le May Doan is set to kick off Hockey Alberta’s 2017 Hockey Conference and Annual General Meeting on Friday, September 29. The keynote address by Le May Doan will kick off two days of sessions and discussions for members of the amateur hockey community in Alberta focused on the benefits of being a multi-sport athlete, and the role it plays in long-term player development. In addition to being a busy hockey mom, Le May Doan currently works with Sport Calgary, helping to advance amateur sport in the City. The retired Olympian has also served as a board member with Winsport, as well as the Vancouver Organizing Committee for the 2010 Winter Olympics, and is still actively involved in many other charity organizations. As an athlete, she won back-to-back gold medals in the 500 metre speed skating event in 1998 and 2002. As a speed skater, Le May Doan broke 13 world records, and won the Lou Marsh Award as Canada’s Athlete of the Year in 2002, and won the Bobbie Rosenfeld Award as the Canadian Female Athlete of the Year three times. Off the ice, Le May Doan has covered five Olympic Games, and co-hosted the primetime show Countdown to Beijing. She was given three honourary degrees, and was inducted in Canada’s Sports Hall of Fame and the Canadian Olympic Committee’s Sports Hall of Fame, and was appointed an Officer of the Order of Canada - one of Canada’s highest honours. She was one of four athletes to light the cauldron at the 2010 Winter Olympics in Vancouver. As a busy sport parent and active coach, Le May Doan understands firsthand the challenges that Minor Hockey Associations face when it comes to competition within the sport and encouraging athletes to participate in other sports. The 2017 Hockey Conference and AGM runs September 29-30 at the Sheraton Hotel in Red Deer. RED DEER - Hockey Alberta and the Officials Committee are pleased to announce three officials have been selected to attend the Hockey Canada Level Six officiating seminar in Moncton, New Brunswick on Novemer 22-26. Kyle Kowalski (Edmonton), Colin Stefanyk (Red Deer), and Jordan Lightbown (Medicine Hat) will be attending this event, which is the highest level in the officiating program in Canada. Hockey Alberta and the Officials Committee would like to congratulate each official on their selection. CALGARY - A unique opportunity is available for aspiring female coaches to attend a female-only coach clinic in Calgary or Edmonton this fall. The We Are Coaches clinic runs from 8:15 a.m. until 2:30 p.m. at the Max Bell Arena in Calgary on September 17, and from 8:15 a.m. until 3:30 at the Clare Drake Arena in Edmonton on September 24. The program is free of charge. Attendees will need to bring their skates, gloves, stick and helmet, as well as their own lunch. The clinic includes an in-class session in the morning, and an on-ice session after lunch.